As the head chef in my home, I strive to create healthy, mostly vegetarian meals that are as unprocessed as possible. But I’m not cooking alone! 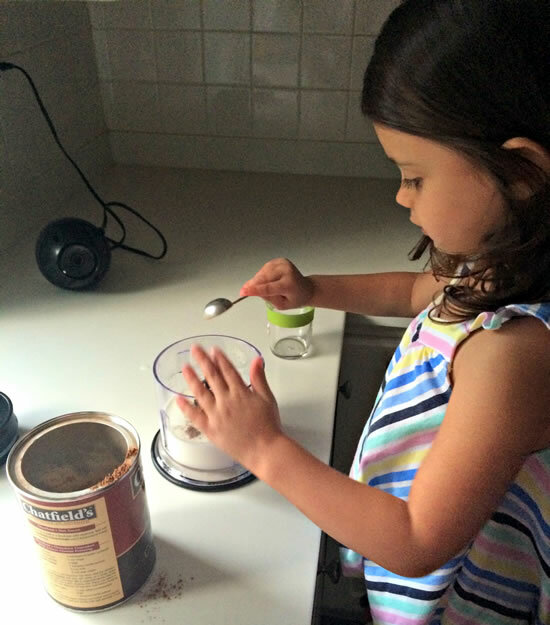 I’ve got a very special sous chef: my 4-year old daughter who loves to help out. In fact, she’s been spending time with me in the kitchen since she was a young baby. Once she got a little older and I began making healthy, unprocessed baby food for her, she would play with the ingredients that I was using. 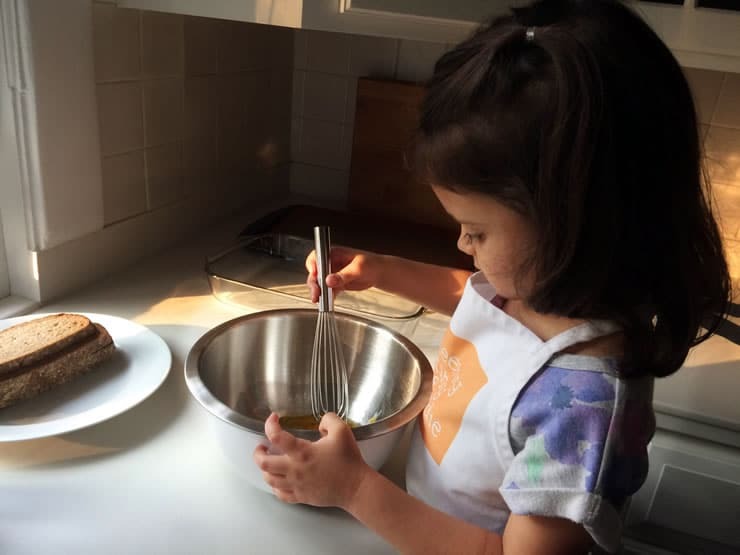 As she became a toddler, her involvement in the cooking process evolved from an engaged observer to an actively involved helper and recipe creator. While I brought my daughter into the kitchen with me as a way to keep my cuddly baby close while I went about my day, it morphed into a fun way to spend time with her and introduce her to real, healthy food. 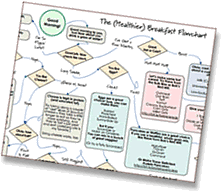 But along the way, I discovered that involving her in food-focused activities like discussing why we would use certain ingredients was producing a benefit I hadn’t anticipated. Not only were we spending time together, but my daughter was also learning about and enjoying eating real, healthy, unprocessed food. I realized that I could capitalize on her budding interest in food and expand it to other parts of our day like discussing what we would eat and which colors of fruits and vegetables would be included. She loves selecting colorful produce at the farmers market or grocery store and together we discuss what to cook. I believe that by introducing kids to a variety of foods and food concepts, we can help to mitigate their fears about food and steer them towards making healthy, real food choices when eating. There are many ways we can teach kids about food and food concepts and I’ve been using my background in early childhood education to develop some “lessons.” But I think the most fun tip is: cook with your kids. A few notes about cooking with toddlers and kids: Recipes will typically take longer than expected since you’ll be guiding your little foodie along the way. Plan to spend at least a few minutes checking over your child’s work and (likely) finishing some of it. Your kitchen will be a lot messier than if you were cooking alone, but it’s worth it to get a little chef cooking with you. Also, don’t be surprised if some ingredients get tasted along the way. It’s all part of the fun! Below I’m sharing five unprocessed recipes that my daughter and I love to cook together along with ideas for how to get your little one involved in the cooking fun. For more recipes to cook with your kids, check out these illustrated recipes I’ve begun sharing. I love to make this recipe with kids because they can do much of the work by themselves and if you’ve spent time with a small child you know they are all about doing things by themselves! 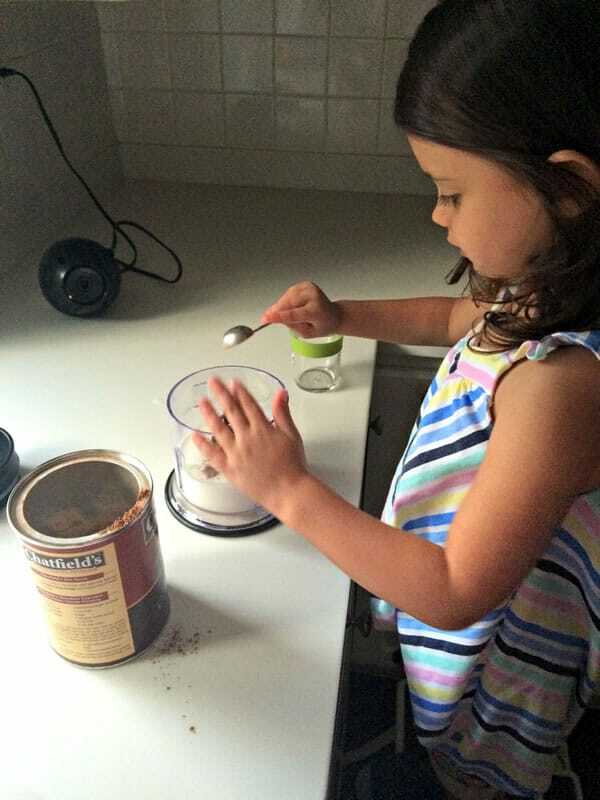 Alone, kids can put all ingredients into an air-tight container and stir or shake it up to combine. With assistance, they can measure out the ingredients before adding them to the container. Add all ingredients, except toppings, to an air-tight container. Mix well and refrigerate at least 6 hours or overnight. 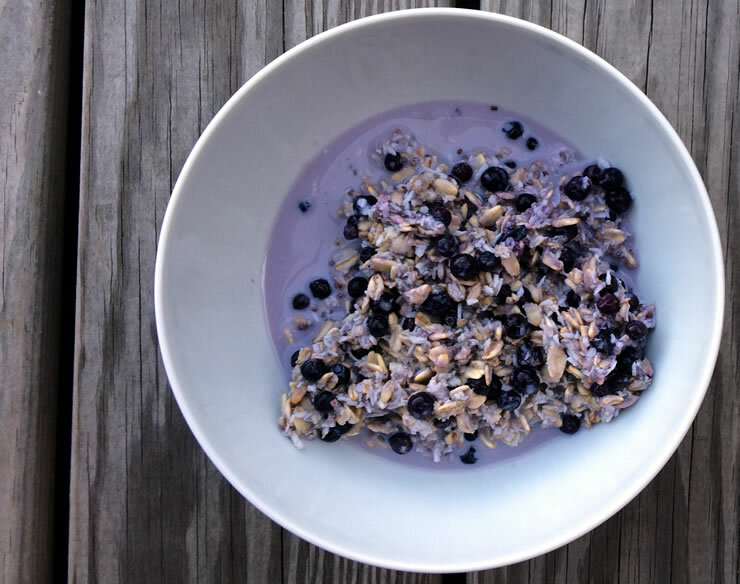 You can heat the oats in the microwave for 30 seconds to 1 minute to remove the chill, if desired. Top with additional toppings and enjoy! Yields 1 generous adult serving. Divide recipe in half to make a toddler serving. This will last 2-3 days in the fridge. Alone, kids can chop the mozzarella, pour the ingredients for the filling into the bowl and stir it all together. They can also help stir the mixture with the partially cooked pasta. With assistance, kids can measure out ingredients, help grate the carrots and fill the baking dish. Bring a large, lidded pot of water to a boil and add a pinch of salt plus 1 teaspoon of olive oil. Cook the shells according to the directions on the package minus 4 minutes, stirring occasionally, and drain. Place shells back into the pasta pot and pour remaining olive oil over the top. Stir and set aside. 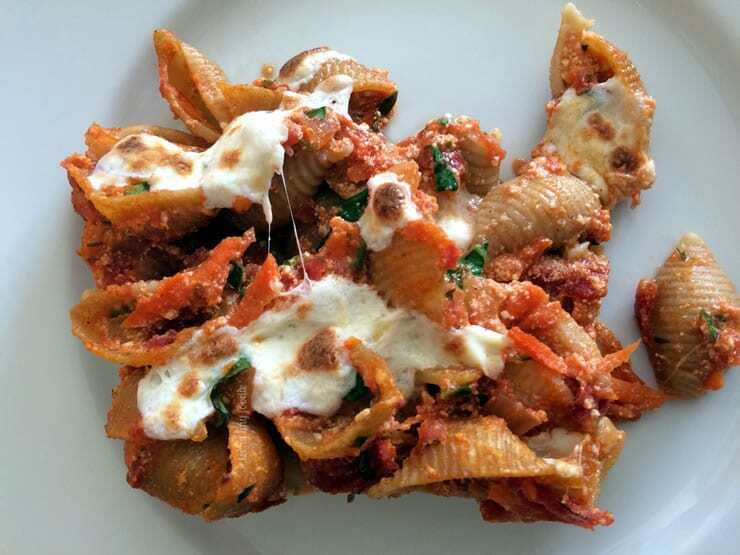 Into a large bowl, place the ricotta cheese, 1 tablespoon of the parmesan cheese, ¾ of the cubed mozzarella cheese, (around 1 cup) the grated carrot, sliced spinach, remaining salt, ground pepper, garlic powder, and red pepper flakes, if using. Mix together. Add the marinara sauce and stir until it is all combined. Taste and adjust spices as desired. Pour the filling over the pasta and stir together well. Pour the pasta and filling mixture into the greased baking dish. Top the pasta with the remaining mozzarella and parmesan cheeses. Cover with tin foil and bake for 25-28 minutes. Uncover and broil on low for 5 minutes, until browned. Let cool for 5 minutes before slicing and enjoying. Alone, kids can pour ingredients into the bowl and whisk them together as well as add the slices of bread to the egg mixture. Just be sure to help clean those little hands with raw egg on them. With assistance, kids can measure out the ingredients and place the uncooked slices onto the baking sheet before cooking. Heat the oven to 375°F and line a baking sheet with a Silpat or parchment paper. Whisk all of the ingredients together in a large bowl. One piece at a time, dip each side of the bread into the egg mixture. I like to gently press down the bread to let it soak in some of the egg mixture. Place bread slices on baking sheet and bake for 12-13 minutes, flipping once after 6-7 minutes. 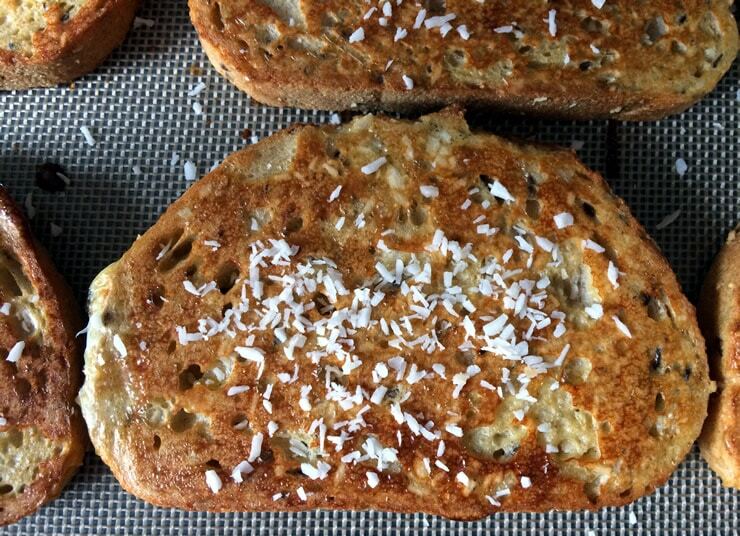 Top each slice with a sprinkle of coconut flakes, additional desired toppings and enjoy! This is another recipe that your little one can prepare mostly by himself or herself. It’s such a simple treat made with just three ingredients. With assistance, kids can measure out the ingredients. Alone, kids can put all ingredients into the blender and push the buttons. Place all ingredients in a blender and mix. Pour into cups and enjoy! Alone, kids can crush the chips in a sealed zipper-top bag, use a salad spinner to dry the greens, add all ingredients to the blender the food processor and push the buttons. With assistance, kids can wash and chop the vegetables and help mix everything together. 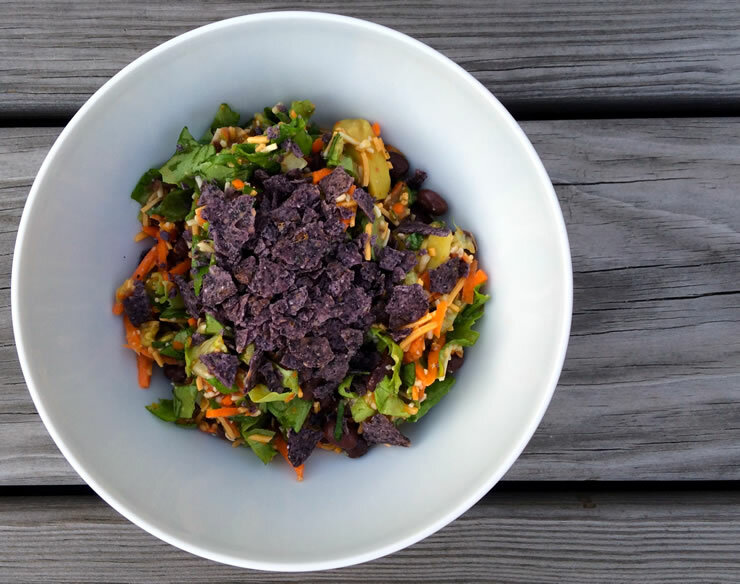 Mix the carrot, cheese, and beans in a large bowl and set them aside. Please change the headline to say “to” instead of “you can.” The way it is has the off-putting suggestion, which I know you didn’t mean, that you can’t make all unprocessed recipes with kids. Now that I got that off my chest I’ll go read the recipes.